MANNAT (Managing And Nurturing Natural Talents) happens once in every two years aiming to stimulate and explore the natural talents and the hidden potentials within individuals, nurture them and mold them to build superlative managerial skills. This year the 2-day national Level inter-collegiate Management Festival – ‘MANNAT’ 10’, from 5-6 April 2010. 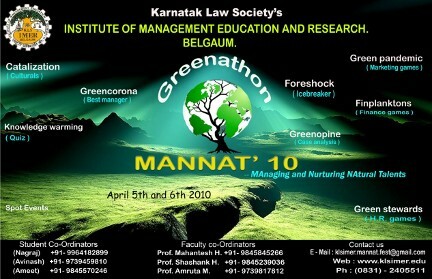 The theme of the event for this year is GREENATHON, an initiative to protect Mother Nature. The theme was chosen to emphasize it is high time now we realize that, if we do not take any steps to protect our nature, we will have to buy Oxygen (O2); and the generation next will see the wild-life only in pictures. Nearly 180 participants from 20 Management Institutes from all over India are expected to participate in the Management Festival. The Festival aims to bring out talents of the Institutes from different arenas – Marketing, Finance, Human Resource, General Knowledge, Cultural etc. Karnatak Law Society’s Institute of Management Education and Research (IMER), Belgaum, ranked as an A+ B-School by Business India and ranked 36th among promising B-Schools in India by Competition Success Review.